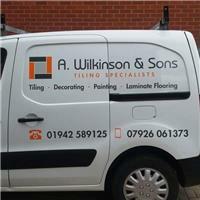 A. Wilkinson & Sons - Kitchens, Roofer, Tiler - Tiling based in Wigan, Greater Manchester. A. Wilkinson & Sons is a family run business with 16 years’ experience in tiling and laminate flooring, recently setting our family business up in 2016. we specialise in kitchens, bathrooms, tiling, laminate flooring, painting and decorating. No job is too big or too small, we offer free quotes, working 7 days a week within a 15 mile radius of Wigan. We will work at suitable times that meet your needs; early mornings and late evenings. We are professional, good timekeepers, tidy and always receive good customer feedback.